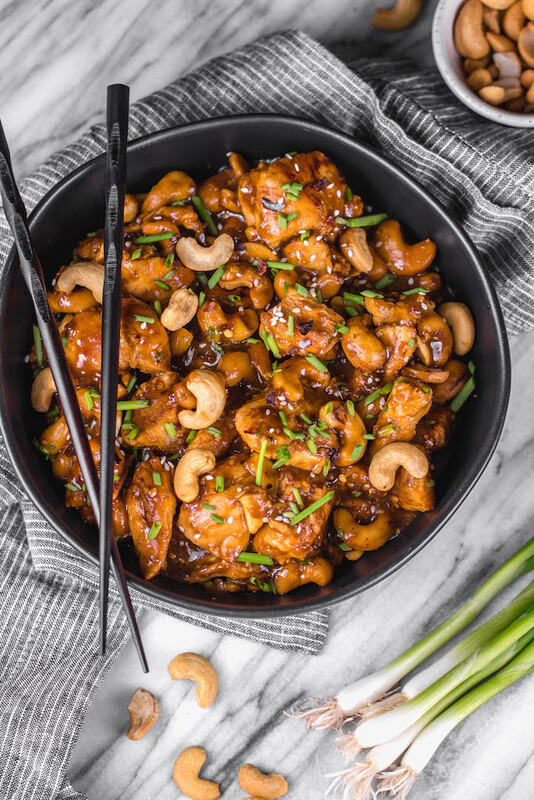 This instant pot cashew chicken tastes like the familiar Chinese takeout we all love, but in a better-for-you, Whole30, Paleo, gluten-free version that only takes 30 minutes. No more waiting for your delivery full of MSG! This instant pot paleo cashew chicken is a family friendly meal, I promise even those who don’t adhere to a real food diet will love it. 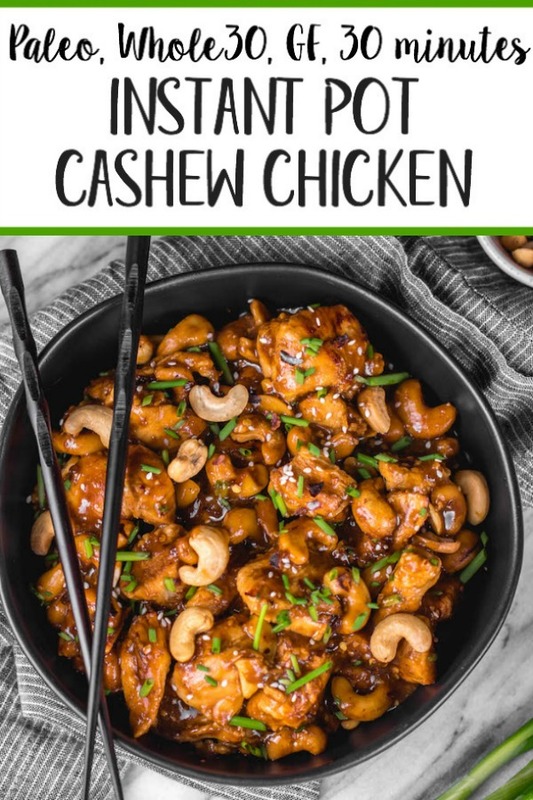 My recipe for instant pot cashew chicken is the closest I could get to the real deal. Many healthy cashew chicken recipes out there have a bunch of veggies added (which is great! duh!). But when I’m craving those takeout cartons of cashew chicken, it’s the chicken, cashews and rice I want, you know?! I wanted to have a go-to recipe that I know will satisfy those cravings in a healthy, Paleo way so being tempted to eat crappy isn’t even worth it! Especially when I can have it ready to eat in only a half hour.. much less time than it takes to order in. The recipe itself is super simple and would be great for a quick weeknight meal. While it looks like there’s quite a few ingredients, I assure you it’s largely the spices, seasonings and Paleo/Whole30 substitutes you already have hanging out in the pantry. Some of the things you’ll need is an instant pot, of course. But I’m assuming you already gathered that. 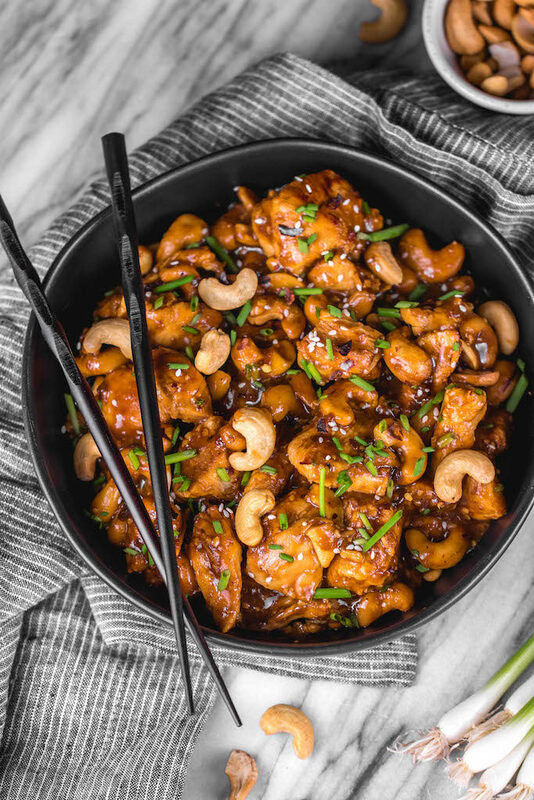 The cashew chicken recipe also calls for coconut aminos, raw cashews (roasted or lightly salted is fine, whatever floats your boat), arrowroot flour for thickening, sesame oil and ketchup. Most of this can be found in the grocery store or cheaper on Thrive Market. You can also make your own Paleo and Whole3o ketchup, or grab a bottle of Primal Kitchen’s Whole30 Approved ketchup. It’s by far the best healthy, sweetener-free ketchup that’s available. I’m not even just saying that. My (not Paleo) boyfriend goes through it constantly and won’t touch the old stuff anymore. It’s available at Whole Foods, or online on their website for 5 bucks (save 10% off your order with code “PALEOBAILEY” at checkout). I also really recommend not skipping out on the Chinese Five Spice either. This spice, often just label “five spice” in the grocery store, is one that really adds so much flavor to Chinese-inspired dishes. It’s what gives East Asian inspired recipes that familiar tangy-sweet flavor and basically it’ll take your meals up a notch. Pretty much every grocery store has this, from Target to Whole Foods to Walmart either with all of the spices or the international items. I’ve linked it here so you can see what it looks like, but it’s much more expensive on Amazon than it is in stores and I recommend grabbing it from there next time you’re grocery shopping. If you’re on a Whole30, you can omit the sweeteners for the instant pot cashew chicken. Instead, you can opt for 2-3 tablespoons of fresh orange juice. If you’re not currently doing a Whole30, the recipe calls for coconut sugar and honey. If you wanted to use only one, you can add an additional tablespoon of coconut sugar to replace the honey. I’ve tried it both ways or without both while testing this recipe, but I found that the honey helps make the sauce and chicken a bit more “sticky” and thicker. The coconut sugar adds a deeper, slightly sweet flavor to balance out the vinegar. Check out my Whole30 Cashew Chicken One-Skillet Recipe with veggies and a “peanut” sauce! 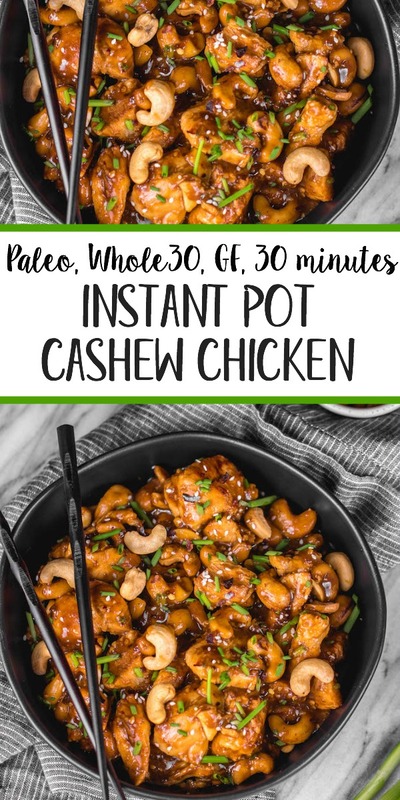 This Whole30 instant pot cashew chicken post may contain some links that are affiliate links, though products are ones I use personally and recommend. When you purchase anything using my links, it costs you absolutely nothing extra, but it does give wholekitchensink.com a little financial support which helps to keep this blog running. Thank you for your continued support, both with your dollars and your interest. This is UNREAL. Bailey. UNREAL. I used a bit of orange juice like you suggested to keep it Whole30 and i couldn’t tell you if it felt like anything was missing without the sweetener because oh my it was too good to care! Ahh that’s so great to hear!! Thank you for letting me know! Great! I’m so glad it was a hit 🙂 Thank you for coming back and letting me know!! I’m glad it worked out so well for you and that you enjoyed it! Thank you, Kathy! This. is. MONEY! I literally just exclaimed that after my first bite then immediately returned to my computer to leave this comment. This recipe is decadent without the scary ingredients. Absolutely love it and will be making regularly. Haha!! So so happy you loved it!! Thank you so much for letting me know! could you cook broccoli in the instant pot at the same time? It would get really mushy if it was in for the same length of time. What you could do is steam it in the microwave (in 3/4ths of a bowl with water for about 1.5-2 minutes) and mix it in when you’re thickening the sauce, or add it in the end after the chicken cooked and set the IP to manual 0:00 on sealing to cook it in the IP. Made it, but my instant-pot complained that it was burning. I stopped the cooking a little early because of the burning, but it seemed well done anyway, so didn’t worry about it. It still tasted great! Any ideas of what happened? Meg, I’m a little late to the party here, but the exact thing happened to me and I had to google it. After the initial saute, you need to scrape the bottom of the pot because it’s sticky and covers the sensors – it solved the problem immediately (and it was quite clear that this was the problem). My husband and I also enjoyed the recipe! I HATE being this person but I have to ??? ?‍♀️Do you think I could omit the ketchup? I can’t tolerate tomatoes. I know you wouldn’t know for sure but how much does it add to the recipe? Would it still be good? It looks soooo delicious!! I was going to ask the same thing. My little girl can’t eat tomatoes but she would love this recipe. Did you try it without the ketchup? This looks so good! Going to make it pronto. When you add the oil to the IP and sear, mean sear the chicken? This was so easy and delicious! My picky husband even said it’s a keeper! I’m SO glad you both enjoyed it!! Thank you so much, Sara! Holy moly, I guess I didn’t really know what to expect when I decided to make this recipe but it turned out phenomenal!! Better than takeout Chinese food by far, I’ll be making this again soon. Thank you Bailey! Oh, I love hearing this! Made my night! Thank you, Danielle! Made this tonight. It was great. However, your recipe is a bit confusing as your ingredient measurements aren’t uniform, ie tablespoon, TBSP, tsp etc. Yummy recipe. Hmm, I only see one that is spelled out! Thanks for the feedback, glad you were able to figure it out 😉 Happy you enjoyed the recipe!! FANTASTIC. Seriously, best “healthy” recipe I’ve ever made. My husband thinks I should go on a cooking show now so basically.. you win. Thanks, Bailey!! I never leave comments, but this was excellent. Next time I’ll use thighs (breasts always dry out on me idk why) and just season/toss in arrowroot in a bowl vs bag (couldn’t get and even distribution.) BUT, this sauce was exactly what I’ve been looking for. WTG Bailey! Thank you so much Jess! I so appreciate that!! Can you do this recipe in a foodi ninja? I’m unfamiliar with that appliance, but if it’s a pressure cooker, you certainly could! This looks amazing! I don’t have an instant pot. Has anyone tried it without? This was delicious! I took it to a potluck and it was wiped clean… if I want to double or triple the recipe, do I double/triple the cooking time too? Not super well versed in instapot cooking yet! Could I make this just on the stove top with the same recipe? YUM! Just finished eating this!!! This was so good and so easy to make!! I will definitely make again. I didn’t have sesame oil so I sauteed chicken in a little bit of ghee. I may have used a little too much Chinese 5 spice (was a bit strong flavor but still good) so I may try and use a pinch or two less next time. I made the dish first then then put aluminum foil on top of pan and placed in a warmed oven so I could make some rice in the IP too. The sauce was nice and thick and I like how after sitting awhile the cashew were a little soft. Thank you for a delicious recipe!! This was a great meal! I don’t have an Instapot so I simply reduced the sauce in a saucepan and cooked everything else in a wok. It was great! Awesome!! Thanks so much, Erin!! I made this for dinner last night and I CAN NOT WAIT to eat leftovers for lunch today! So so so good! I don’t have an Instant Pot can this be made in a crockpot? I don’t have arrowroot powder or coconut sugar. And I dont have any of the substitutions for the sugar either. Any suggestions? This looks amazing! Anyone who has made this in a crockpot, what was your cooking level and time? Any other crock pot tips for this? Another happy eater – I made this last night in our InstaPot with a few substitutions. We couldn’t find Coconut Aminos anywhere (live in Canada) and no time to order on Amazon. So I used coconut powder with low sodium soya sauce. Maple sugar instead of coconut sugar and cornstarch replaced arrowroot flour. So it wasn’t Whole 30 but it was a WHOLE LOT OF DELICIOUS. I did add some extra liquid 3/4 broth when the cooking time finished, because we wanted more sauce. So tasty, the chicken fell apart, used thighs but maybe I sauté mine too long before pressure cooking. We will be making again. Thank you Bailey for sharing your this! Ohhh that sounds so good!! Thank you so much, Candice! It was good – didn’t turn out quite right. 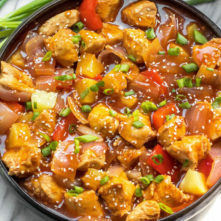 The recipe was hard to read for example it did not clearly state to sear the chicken and in the first step it says combine 1 tbsp sesame oil but then does not say the measurements for the rest of the ingredients making it very confusing. That’s because sesame oil is an ingredient that is divided, and used twice- a very common practice in recipe writing if the other ingredients are used in the amount they’re called for in the ingredient list so the instructions don’t look messy or MORE confusing with quantities all over the place. Thanks for your feedback! 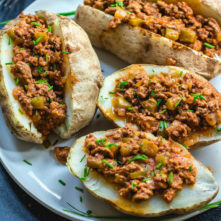 Anyone know how this could be made in a slow cooker? I am on the Keto diet, so no honey or maple syrup or coconut sugar for me. I’m going to try it with Sukrin Gold and Monkfruit sweetener. I’ll comment again when I do and let you know how it turned out. Substituted almond flour. Only issue was IP said burn so I stopped, released pressure and stirred. Continued to cook about five more minutes, not burnt. Delicious! Do you think I could substitute tapioca starch for the arrowroot and achieve a similar result? Made this last night…it was amazing. 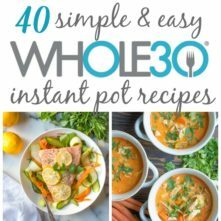 New favorite instant pot recipe!!! are the cashews supposed to be raw ones or roasted? It doesn’t make too much of a difference. You don’t really cook the cashews, just stir them in so if you have a preference one way or the other that’s totally fine! I made this for supper. 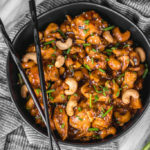 Cashew chicken is one of my husband’s favorites, but it never appealed to me. I’m happy to say this recipe changed my mind! It was just awesome, and I’m about to share it on FaceBook. I didn’t have sugar-free ketchup, so I used regular Heinz, and I added about a cup of chopped green onions near the very end because he loves them. He gave it five thumbs up, and I enjoyed it as much as he did. Thank you so very much for a valuable addition to my instant pot collection! YUM! That sounds so good!! Thank you for coming back and letting me know, Shannon!! I’m a huge fan of your podcast and I wanted to try this recipe after i heard you mentioning it. Its so good! Definitely going to add this to my meal plan menu.